The Maryland women’s basketball team continues to get attention on the national scene for their strong play over the last several seasons, while the men’s team has finally made it to the tournament for the first time under its current head coach. The fourth-ranked women’s team was selected as the top seed in the Spokane, Washington (West) Region of the NCAA Division I Women’s Basketball Tournament on March 16. Maryland finished the season 30-2, ending on a 24-game winning streak that included going undefeated during the Big Ten regular season and conference tournament. This is the fourth time Maryland has been selected as a regional top seed in the tournament, and the third time under Head Coach Brenda Frese, who was named Big Ten Coach of the Year. 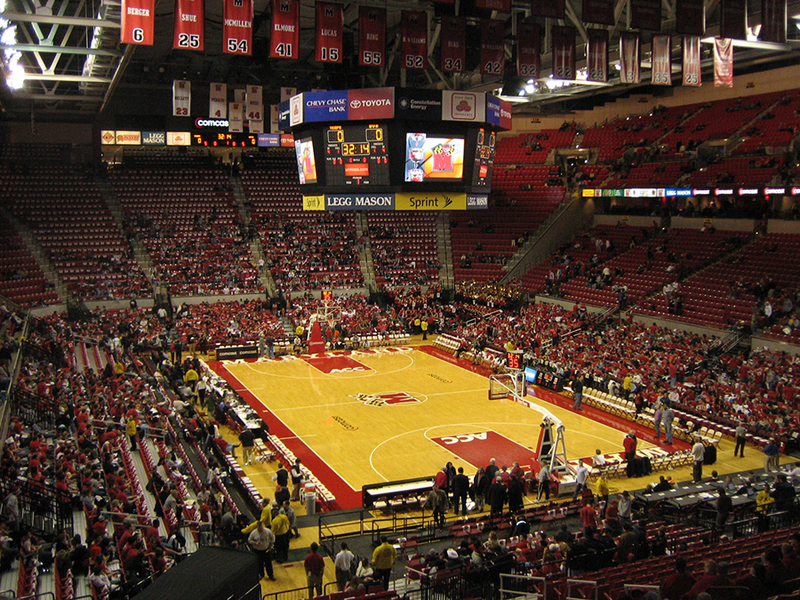 Interior view of the Xfinity Center, home of Maryland basketball, prior to joining the Big 10. Sophomore guards Lexie Brown and Shatori Walker-Kimbrough were named to the All-Big Ten Conference First Team by the league’s media, while senior guard Laurin Mincy was named to the Second Team, and sophomore center Brionna Jones was named to the First Team by the coaches and the Second Team by the media. The Lady Terrapins pulled away for a 75-57 win over #16 seed New Mexico State at Xfinity Center on March 21. Jones had 22 points and 12 rebounds to lead three Terps players in double-figure scoring. On March 23, Maryland beat #8 seed and previously undefeated Princeton 85-70 to advance to the Sweet 16 for the fourth straight year. Mincy went six of seven from three- point range on her way to a game- high 27 points and seven assists. Four other Terps scored in double figures as Maryland shot 56 percent from the floor in the second half, including seven of eight from beyond the arc. Leading 42-38 at halftime, Maryland went on a 20-4 run in the first seven minutes of the second half to jump out to a 20-point lead, and led by as much as 24. The Terps (33-2) successfully defeated former ACC rival Duke on March 28, 65-55 and will advance to play Tennesee in the Elite Eight on March 30 at 9 p.m. If they win, they will head to the Final Four in Tampa Bay, Florida to face the winner of the Albany Region’s Connecticut vs. Dayton face off. The Maryland men made it into the tournament for the first time under Head Coach Mark Turgeon. The Terrapins were selected as the fourth seed in the Midwest Region, which also has undefeated and top overall seed Kentucky. Maryland went 26-5 overall and 14-4 in the Big Ten during the regular season, and won eight of their last nine games. The Terrapins beat Indiana 75-69 in the Big Ten Tournament quarterfinals in Chicago on March 13, but lost to Michigan State 62-58 the following day in the semifinals. Michigan State would eventually lose to Wisconsin 80-69 in overtime in the tournament championship game. Senior forward/ guard Dez Wells was named to the All-Big Ten First Team by the league’s coaches and to the Second Team by the media. Junior forward Jake Layman was named to the Third Team by the media, while freshman point guard Melo Trimble was named to the First Team by the media and the Second Team by the coaches. Turgeon was named Big Ten Coach of the Year by the media. Maryland began the tournament by holding off the upset-minded Valparaiso Crusaders, the 13th seed in the Midwest Region, on March 20 at Nationwide Arena in Columbus, Ohio. Wells and Trimble each scored 14 points to lead the Terps, but it was a strip by senior guard Varun Ram of Clarksville in the final seconds that sealed the win. Wells provided the margin of victory by scoring while getting fouled on an offensive rebound, and then making the free throw with 1:44 left. Two days later, Maryland struggled with #5 seed West Virginia’s harassing press and frenetic pace, committing 23 turnovers in a 69-59 loss to the Mountaineers. Trimble had 15 points and seven rebounds, but left midway through the second half after appearing to get kneed in the back of the head by teammate Damonte Dodd. Trimble, who’s said he’ll be back for his sophomore year, was later diagnosed with a concussion. Maryland finished the season with a record of 28-7, and will return three starters next season—Trimble, Layman and Dodd.